Originally by Light, M.P.R., October 21, 2011, edited by Carana, S.
By 2004 methane had formed a world encompassing stratospheric global warming veil between 30 and 40 km heigh (0.7 ppm methane = 3 GT methane emissions) where the mean methane global warming effect was equivalent to about 70 ppm carbon dioxide (Figure 1)(Nassar et al. 2005; Light 2011). However the stratospheric methane concentration ranged almost as high as about 1 ppm methane ( = 5GT of Arctic methane emission) which is equivalent to the global warming potential of some 100 ppm carbon dioxide (Nassar et al. 2005; Light 2011). The mean value of methane concentration in 2004 in the stratosphere between 30 km and 40 km height is equivalent to the maximum amount of methane (3.3 GT) that should be expelled by the decomposition of the Arctic methane hydrates by 2029 (Figure 1)(Light 2011). What does not bode well for our future survival as a species in that even by 2004, the mean stratospheric methane concentration between 30 km and 40 km altitude had already exceeded the predicted mean atmospheric 0.66 ppm atmospheric methane concentration (3.3 GT of methane emission) predicted for 2029, while the maximum stratospheric methane concentration (1 ppm atmospheric methane concentration = 5 GT of Arctic methane emission) had reached values almost 1.5 times times as high as the 2029 value by 2004 (Figure 1). 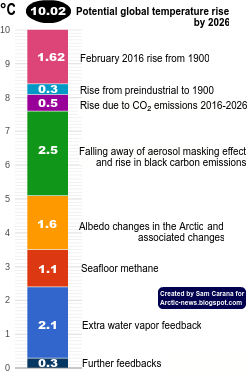 The present day rate of expulsion of methane into the atmosphere from the Arctic region (1.87 to 2 ppm methane = 9.35 to 10 GT of Arctic methane expelled) is equivalent to a mean worldwide temperature rise of some 1.87 to 2°C (Light, 2011; Blasing, 2011). If this was the mean atmospheric methane concentration it would represent the final tipping point after which mankind will lose all control of the now fast accelerating and self sustaining global warming system. As the light-rising Arctic methane is spread around the world by the Arctic stratospheric vortex system (NSIDC 2011a), it can be expected to lead to more ozone and water vapor in the stratosphere, both of which will add to the greenhouse effect and thus cause temperatures to increase globally. In the Arctic, where there is very little water vapour in the atmosphere, the ozone layer may well be further depleted, because the rising methane behaves like a chloro-fluoro-hydrocarbon (CFC) under the action of sunlight increasing the damaging effects of ultraviolet radiation on the Earth’s surface (Engineering Toolbox, 2011; Anitei, 2007). Large abrupt releases of methane in the Arctic lead to high local concentrations of methane in the atmosphere and hydroxyl depletion, making that methane will persist longer at its highest warming potential, i.e. of over 100 times that of carbon dioxide. (Carana, S., 2011a). The presence of a large hole in the Arctic ozone layer in 2011 is most likely a result of this same process of ozone depletion caused by a buildup of greenhouse gases from the massive upward transfer of methane from the Arctic emission zones through the lower stratosphere up into the stratospheric veil between 30 km and 47 km height (Science Daily, 2011). The stratospheric methane veil between 30 km and 47 km will continue to increase in concentration and depth causing further catastrophic global warming. The combined dangers of the lack of the ozone shield (as polar ozone holes grow) and of the extremely high and rising temperatures may lead to the widespread extinction affecting all species of life on Earth. Winter rains have been delayed a month this year in Spain and on October 14th, 2011, Seville measured a temperature 10°C higher than the previous year. It seems as though the 10°C temperature anomaly of this stratospheric methane global warming veil has already overlapped Spain and is spiraling westwards and southwards to the New World and Pacific where it will greatly enhance the El Nino effect before it starts to penetrate the southern hemisphere. Anitei S. 2007. How is the Ozone layer menaced? The Daily Climate. www. Daily Climate.org. Blasing T.J. Recent Greenshouse Gas Concentrations. CDIAC. Carbon Dioxide Information Analysis Center. Engineering Toolbox, 2011. Gases – Specific Gravities. Nassar R., Bernath P.F., Boone C.D., Manney G.L., McLeod S.D., Rinsland C.P., Skelton R., Walker K.A., 2005. Stratospheric abundances of water and methane based on ACE-FTS measurements. Geophysical Research Letters, Vol. 32, LI5504, 5 pp. NSIDC, 2011a. The Polar Vortex. National Snow and Ice Data Center. Science Daily, 2011. Record Depletion of Arctic Ozone Layer Causing Increased UV Radiation in Scandinavia. Knowing what we do now about Methane spread and accumulation in Stratosphere, warming potential of Methane and that vast amounts of the stuff are held in water ice crystal matrix of hydrate on vast shallow Arctic continental shelf, why are the two party presidential candidates of the US not seeing it their duty to declare emergency and to make the attempt to try and keep Earth alive? The Green Party's Candidates for President and VP were jailed and kept quiet. I suggest that methane is like water, it escapes earth following cracks, passageways from deep within earth. We have springs, which water continually runs from. We also drill "wells" to pull water from earth. Dr. Semiletov in below article points out "methane fields of a fantastic scale". "Drilling for Methane" could be carried out and the "gas" compressed for storage. The compressed gas could be burned and used for energy and could be injected into soil for fertilizer as we now inject Nitrogen into soil for fertility. The bi-product from this rotting vegetation is compost. We have a huge compost pile beneath the Arctic and Ant-Arctic which we must "harness" and utilize. Water ice crystal specific to temperature and pressure encapsulating CH4 lays in shallow Sea floor in quantities, if estimated right way over ext. CH4 is 105X global warming potential of CO2 at 20years assuming reactant and conditions for its breakdown to CO2 and water remain not swamped out.. But we don't need to drill wells to pull it from Earth, Water ice melting will make our lives easy as we sit back and watch TV reports soon to flow. Reports of the rising force of Extinction will have sprung from Earths' core like magic. Who could have known, Who could have said something. Me..
Reports are coming in f CH4 levels in excess of runaway kick back to sky.. I'll be damned if I'll be a patsy to big O, Mr Obama and his oil friends. We had 350 marchers in Denver the day Barack played golf in Florida with his oil buddies and we had Zero media coverage that I know of. 350.org and all manner of protestors marched for getting US off oil. The Barack war machine and the big money behind the Big Medea Corporate. The properties of elements that make up the sky don't lie.. 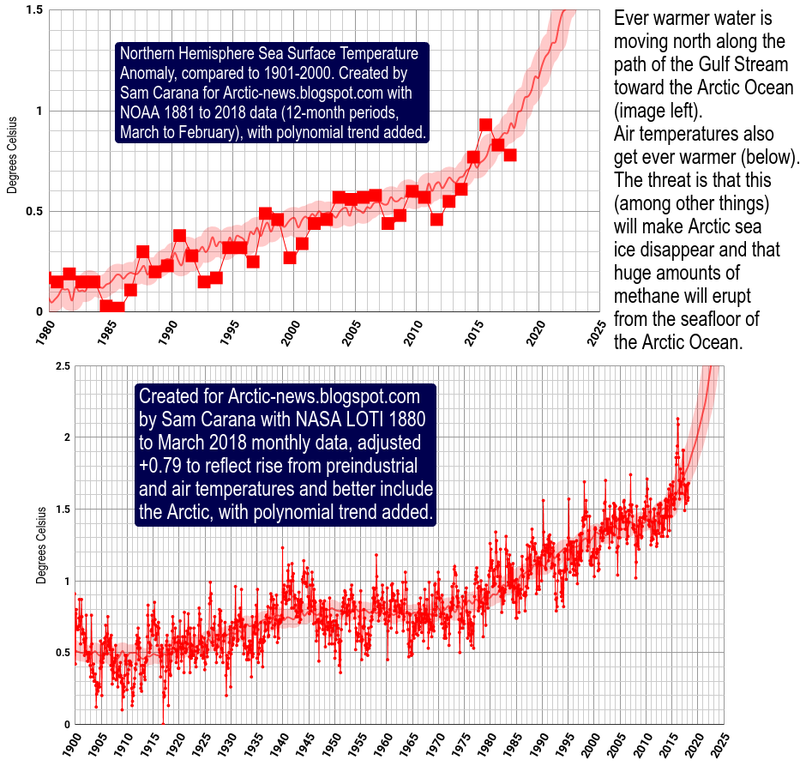 The Methane is releasing increasingly from Arctic sea bed. Earth is losing reflectivity and ability to shed heat to sky.. -What the hell, Mr Obama do you think you are doing if not etching the death sentence for Earth.